¿Moscú o San Petersburgo?? Descubrámoslo en un entretenido viaje en tren por as capitales rusas. Era mayo, y teníamos a la vista unos días de vacaciones…¿Quedarnos en casa?…No gracias!! HABLANDO CON LOS AMIGOS POR SI ALGUNO SE APUNTABA A UNA ESCAPADITA AVENTURERA DE 5 O 6 DÍAS, ASÍ FUE!! PABLO DIO UNA MUY BUENA OPCIÓN, SE TRATABA DE RUSIA, NO ERA UN DESTINO DE ENSUEÑO PERO PARECÍA INTERESANTE. ENSEGUIDA ENCONTRAMOS UNA OFERTA MUY BUENA DE VUELO, 250EU DESDE MADRID A MOSCÚ CON ESCALA EN PRAGA. EL PRECIO ERA PERFECTO, Y ENCONTRAR UN BUEN HOTEL TAMBIÉN FUE CUESTIÓN DE TIEMPO. PUES YA ESTÁBAMOS CON UN BILLETE Y UNA RESERVA DE HOTEL!!! A LO LOCO!! EMPIEZA LA AVENTURA EL DÍA 6 DE JUNIO, SALIENDO DE CEUTA DIRECCIÓN MADRID, A CASA DE PABLO PARA COGER EL AVIÓN EL DÍA SIGUIENTE EN BARAJAS. DESPUÉS DE 7 HORAS DE CARRETERA, Y TODA UNA NOCHE TRABAJANDO SIN DORMIR, LLEGAMOS A VILLAVICIOSA DE ODÓN, VILLA KAISER, ESPERÁNDONOS CON UNA SONRISA Y LOS BRAZOS ABIERTOS, JEJE. COMO EL CANSANCIO ERA EVIDENTE, UNA DUCHA Y CENA LIGERITA, Y A DESCANSAR. SONABA EL DESPERTADOR TEMPRANITO, PARA DESAYUNAR Y COGER EL AUTOBÚS SOBRE LAS 10, QUE NOS DEJARÍA EN BARAJAS. EMPEZANDO CON MAL PIE, YA QUE EL AUTOBÚS NO DEJÓ QUE SUBIÉRAMOS CON LAS MALETAS TAN GRANDES…VAYA!! TUVIMOS QUE IRNOS EN TAXI POR QUE SINO NO LLEGARÍAMOS!! UNA VEZ EN BARAJAS, DESPUÉS DE FACTURAR Y REALIZAR LOS TRÁMITES CORRESPONDIENTES PROCEDEMOS A EMBARCAR, DIRECCIÓN PRAGA. EL VUELO TUVO UNA DURACIÓN APROXIMADA DE 7 HORAS, CONTANDO CON LA ESCALA. UNA VEZ EN TIERRA, SHEREMETYEVO INTERNATIONAL AIRPORT, YA ESTÁBAMOS EN RUSIA, ASÍ DE FÁCIL, COGIMOS NUESTROS MALETONES Y SALIMOS DEL AEROPUERTO RÁPIDAMENTE RODEADOS DE TAXISTAS QUE QUERÍAN LLEVARNOS A CUALQUIER SITIO, ESO YA ERA SOSPECHOSO…PERO EN REALIDAD NO TENÍAMOS MUCHO TIEMPO DE ELEGIR AL MEJOR, ASI QUE AL PRIMERO QUE VIMOS CON MEJOR CARA LO ELEGIMOS PARA QUE NOS LLEVASE A LA ESTACIÓN DE TREN LLAMADA LENINGRADSKY, PARA DIRIGIRNOS A SAN PETERSBURGO. SON 650KM LOS QUE SEPARAN LAS DOS CIUDADES, HAY TRENES DIURNOS QUE TARDAN SOBRE 4 HORAS, Y TRENES NOCTURNOS QUE TARDAN EL DOBLE, PERO TIENEN COCHE-CAMA PARA PODER DORMIR, ÉSTA FUE NUESTRA ELECCIÓN, UNA NOCHE DE HOTEL QUE NOS AHORRÁBAMOS Y UNA EXPERIENCIA MÁS. EL TREN SALÍA SOBRE LAS 00:00 DE LA NOCHE, Y SU PRECIO NO FUE NADA BARATO, LLEVÁBAMOS EL BILLETE DESDE ESPAÑA, UN COMPARTIMENTO DE 4 CAMAS, POR LO QUE PODRÉIS IMAGINAROS…QUE EN UNA DE ELLAS…IBA UN RUSO! !JEJE ERAN MIXTOS ENCIMA, PERO A LO QUE IBA, NOS SALIÓ AL REDEDOR DE 200 EUROS POR PERSONA IDA Y VUELTA, ASI QUE MÁS QUE AHORRARNOS UNA NOCHE DE HOTEL, PASÓ A SER TODA UNA EXPERIENCIA. ESTÁBAMOS ILUSIONADOS, ASI QUE TAN PRONTO COMO NOS DEJÓ SUBIR EL REVISOR, ENTRAMOS EN NUESTRO COMPARTIMENTO, Y CURIOSAMENTE HABÍA QUE HACER LAS CAMAS, COSA QUE NOS LLAMÓ LA ATENCIÓN. NOS ESTÁBAMOS PONIENDO CÓMODOS CUANDO ENTRÓ EL 4 PASAJERO, UN RUSO DE UNOS 25 AÑOS, SONRIENDO Y DEVOLVIENDOLE LA SONRISA, YA QUE NOSOTROS DE RUSO NO HABLÁBAMOS NI PAPAS…FUE GRACIOSO PORQUE LE TOCABA DORMIR ENCIMA MÍA, PERO ESTUVIMOS UN RATO INTENTANDO COMUNICARNOS CON EL, CON EL POCO INGLÉS QUE EL SABÍA Y LAS SEÑAS DE TODA LA VIDA, Y BUENO LLEGAMOS TODOS A LA MISMA CONCLUSIÓN, QUE ÍBAMOS EN UN “RETRO-TREN”, SI SEÑORES, ESA ALFOMBRA DE MOQUETA ROJA POR EL PASILLO CON PINTA DE NO HABERLE PASADO NUNCA UNA ASPIRADORA…ESAS CORTINILLAS Y ESA CISTERNA DE W.C QUE FUNCIONABA CON EL PIE…JEJE, TODA UNA ANTIGUALLA, PERO ERA UN TREN, Y NOS LLEVÓ A NUESTRO DESTINO SIN NINGÚN PROBLEMA. ERAN LAS 8 DE LA MAÑANA CUANDO EL RETRO-TREN HIZO SU PARADA EN LA ESTACIÓN DE SAN PETERSBURGO, MOSKOVSKY. ERA TEMPRANO, NO HABÍAMOS DORMIDO MAL, PERO TAMPOCO DESPRENDÍAMOS ENERGÍA, ASI QUE REPETIMOS LA MISMA OPERACIÓN, YA QUE EN EL MAPA NOS PARECÍA QUE EL HOTEL QUEDABA A UNA BARBARIDAD DE DISTANCIA, Y LO QUE QUERÍAMOS ERA LLEGAR AL HOTEL, DEJAR LAS MALETAS, Y SALIR A CONOCER LA CIUDAD. OTRO GRUPO DE HOMBRE RUSOS CON CARA DE MALA LECHE INTENTABAN HACERNOS SUS CLIENTES…Y BUENO, ALGUNO LO CONSIGUIÓ!! NOS LLEVÓ HASTA LA PUERTA DEL HOTEL, POR CIERTO SE LLAMABA “MARY HOTEL”, Y ES 100% RECOMENDABLE, SE TRATA DE UN HOTEL BOUTIQUE, MUY NUEVO, LIMPIO Y EL PERSONAL MUY AMABLE. EN CUANTO REALIZAMOS EL CHEKING, DEJAMOS LAS MALETAS EN RECEPCIÓN Y PISAMOS LA CALLE, NOS MIRAMOS TODOS CON CARA DE POR FIN YA LLEGAMOS!! AHORA TOCABA CAMINAR Y CAMINAR, CON MAPA EN MANO Y MUCHAS GANAS DE CONOCER ESA CIUDAD, QUE DESDE EL PRIMER MOMENTO ME DIO MUY BUENAS SENSACIONES. ERA UNA CIUDAD TRANQUILA, CON BUEN AMBIENTE, Y MUCHAS COSAS QUÉ VER. COMO ERA EL PRIMER DÍA, LO DEDICARÍAMOS A VER LA CIUDAD, LO MÁS IMPORTANTE, SUS EDIFICIOS, MONUMENTOS, PARQUES, SUS CALLES….Y EL SEGUNDO DÍA LO RESERVARÍAMOS PARA VISITAR LAS FUENTES Y PARQUES DE PETERGOFF PALACE, QUE SE TRATA DE UNA RESIDENCIA VERANIEGA ZARISTA. PASEAMOS POR LA AVENIDA NEVSKY, QUE ES LA PRINCIPAL DE SAN PETERSBURGO, VISITAMOS ALGUNAS DE LAS PRINCIPALES IGLESIAS COMO LA CATEDRAL DE SAN PEDRO Y PABLO, LA DE SAN ISAAC O LA IGLESIA DE SALVADOR SOBRE LA SANGRE DERRAMADA, PARA MI SIN DUDA LA MÁS BONITA. LLEGAMOS A LA PLAZA DEL PALACIO Y PALACIO DE INVIERNO, EL CUAL SE ENCONTRABA EN OBRAS, Y DONDE SE UBICA EL MUSEO HERMITAGE, QUE ES UNO DE LOS MUSEOS MÁS IMPORTANTES DEL MUNDO AL PARECER, NO LLEGAMOS A ENTRAR, PERO SI OS INTERESA ESTÁ FÁCIL DE LOCALIZAR. COMIMOS EN ALGÚN RESTAURANTE DE LA ZONA Y CON EL ALMIRANTAZGO DE FONDO, PARAMOS A DESCANSAR TUMBADOS EN EL CÉSPED DEL PARQUE ALEXANDROVSKY, POR CIERTO CON EL ESTÓMAGO LLENO Y EL SOLECITO PEGANDO, CREO QUE NOS PEGAMOS UNA PEQUEÑA SIESTA LOS TRES…LA VERDAD QUE SE ESTABA MUY BIEN ALLÍ, HABÍA MUCHA GENTE TUMBADA, NIÑOS, INCLUSO VARIAS PAREJAS DE NOVIOS SACÁNDOSE FOTOS. A PESAR DE SER RUSIA, LA ÉPOCA EN LA QUE FUIMOS ERA PERFECTA, CON UNA CHAQUETITA FINA PARA LAS MAÑANAS Y LAS NOCHES, Y EL RESTO DEL DÍA SE PODÍA ESTAR EN TIRANTES PERFECTAMENTE. CUANDO YA TENÍAMOS LAS PILAS CARGADAS, DECIDIMOS SEGUIR CAMINANDO POR LAS INMEDIACIONES DEL RÍO NEVA, HACIÉNDONOS MILES DE FOTOS, VIENDO SU EMBARCADERO, LOS PUENTES QUE LO CRUZAN… QUE HAY NADA MÁS Y NADA MENOS QUE 21, TODOS ELLOS LEVADIZOS. ERA HORA DE REGRESAR AL HOTEL, UNA BUENA DUCHITA Y UNAS CERVEZAS BIEN FRESQUITAS NOS ESPERABAN. BUENO COMO SABÉIS, EN SAN PETERSBURGO A FINALE DE MAYO, Y APROXIMADAMENTE HASTA MEDIADOS DE JULIO, ES EL PERIODO DE LAS FAMOSAS “NOCHES BLANCAS”, DÓNDE EL SOL PRACTICAMENTE NO SE PONE. ES REALMENTE IMPACTANTE, QUE SEAN LAS 2 O 3 DE LA MADRUGADA Y PAREZCA DE DÍA. PUES POR ESTE MOTIVO, LOS TURISTAS SUELEN JUNTARSE EN EL MALECÓN DEL RÍO NEVA, EN PERIODO DE NOCHES BLANCAS, PARA VER COMO SE ELEVABAN LOS PUENTES, ES TODO UN ESPECTÁCULO, LA ORILLA DEL RÍO COMPLETAMENTE LLENA DE GENTE CON CÁMARAS DE FOTOS Y VIDEO, UNA PASADA!! MUY BUEN AMBIENTE. DESPUÉS DE CRUZAR EL PUENTE RÁPIDO, ANTES DE QUE LO LEVANTASEN, NOS DIRIGIMOS AL HOTEL A DESCANSAR, QUE MAÑANA TOCABA APROVECHAR OTRO DÍA. SONÓ EL DESPERTADOR, AUNQUE PARECÍA QUE NUNCA HABÍAMOS DORMIDO, YA QUE NUNCA ANOCHECIÓ DEL TODO. DESAYUNAMOS EN EL HOTEL, YA QUE DISPONÍA DE UN SALONCITO CON CAFETERA, NEVERA Y MINI COCINA. YA SALIMOS DANDO UN PASEO Y CRUZAMOS EL RÍO NEVA POR UNO DE SUS PUENTES LEVADIZOS, SEGUIMOS CONOCIENDO LA CIUDAD, HASTA LA HORA DEL MEDIODÍA, QUE LLEGAMOS A LA ZONA DE EMBARQUE , Y COMPRAMOS LOS BILLETES DE FERRY PARA DIRIGIRNOS AL PALACIO DE PETERHOF. MIENTRAS ESPERÁBAMOS APROVECHAMOS PARA COMER UN PERRITO EN UNO DE LOS PUESTOS CALLEJEROS!! COMIDA RÁPIDA Y BARATA!! BUENO, EL PALACIO SE ENCUENTRA A 29KM DE SAN PETERSBURGO, Y ESTÁ SITUADO EN LA CIUDAD DEL MISMO NOMBRE, JUNTO AL GOLFO DE FINLANDIA. LA MANERA MÁS ECONÓMICA DE LLEGAR HASTA ÉL SERÍA EN BUS, PERO CON EL BUEN TIEMPO QUE HACÍA, DECIDIMOS LLEGAR EN FERRY ADMIRANDO LAS VISTAS POR EL RÍO NEVA Y EL GOLFO DE FINLANDIA. LOS BILLETES APROXIMADAMENTE NOS SALIERON EN 20 EUROS POR PERSONA, DIGO UN VALOR APROXIMADO YA QUE DEPENDE DEL TIPO DE CAMBIO DE ESE MOMENTO. DESPUÉS DE MEDIA HORITA, LLEGAMOS A NUESTRO DESTINO. Y PARA ENTRAR A LA ZONA DE JARDINES Y FUENTES, HABÍA QUE SACARSE OTRA ENTRADA, DE APROXIMADAMENTE 25 EUROS POR PERSONA, LA VERDAD QUE IMPRESIONA, ES UN PALACIO DE ESTILO BARROCO, PRONTO OS DARÉIS CUENTA, Y DESTACA POR SUS PARQUES Y SUS FUENTES, ES DIGNO DE VER. UNA VEZ A LAS PUERTAS DEL PALACIO, Y DESPUÉS DE SACARNOS NO SE CUANTAS FOTOS, TENÍAMOS CURIOSIDAD POR SABER QUE HABÍA EN EL INTERIOR, Y COMO LA CURIOSIDAD MATÓ AL GATO, COMPRAMOS OTRA NUEVA ENTRADA DE 25 EUROS, Y ACCEDIMOS A SU INTERIOR. BUENO, EN PRIMER LUGAR DECIR QUE HABÍA TAQUILLAS EN LAS QUE TE OBLIGABAN A DEJAR TODO, CÁMARAS, BOLSOS…Y LLEVARÍAMOS LOS PIES CUBIERTOS CON UNA ESPECIE DE PATUCOS DE PLÁSTICO PARA NO ENSUCIAR NADA. Y NO SE PUEDE TOCAR NADA EVIDENTEMENTE, ESTÁ LLENO DE SEÑORAS RUSAS CON CARA DE MALA LECHE POR TODAS LAS ESQUINAS, JEJE. EL PALACIO POR FUERA, ES ESPECTACULAR, PERO PARA MI PARECER, NO MERECE LA PENA PAGAR LA ENTRADA PARA VER EL INTERIOR, FUE UNA VISITA MUY RÁPIDA, NO TE DABAN A PENAS TIEMPO PARA VER LAS HABITACIONES, NADA DE FOTOS, NO SE, ME PARECIÓ CARO PARA LO QUE REALMENTE ERA. EL FERRY NOS DEJA DE VUELTA EN EL MALECÓN DEL RÍO NEVA, Y ESTA VEZ DECIDIMOS COGER EL METRO, YA QUE ESTÁBAMOS CANSADOS Y HASTA EL HOTEL ANDANDO ERA MÁS DE MEDIA HORA. OTRA DE LAS COSAS OBLIGATORIAS QUE HAY QUE HACER ES COGER EL METRO. ES FÁCIL, HAY 5 LINEAS Y SALEN CON BASTANTE FRECUENCIA. ESTE METRO ES EL MÁS PROFUNDO DEL MUNDO, PUEDE TENER HASTA 110M DE PROFUNDIDAD, SU EXPLICACIÓN ES QUE LAS LÍNEAS PASAN POR DEBAJO DEL RÍO NEVA, Y ES UNO DE LOS MÁS CAUDALOSOS DE EUROPA. ES ASOMBROSO VER LAS ESCALERAS MECÁNICAS TAN TAN LARGAS, PARECÍA QUE NO TENÍAN FIN, Y MÁS SI ESTAMOS ACOSTUMBRADOS AL METRO DE MADRID. LO MÁS ASOMBROSO, ALGO QUE NO NOS ESPERÁBAMOS PARA NADA, YA QUE RUSIA NO ES UN PAÍS BARATO PRECISAMENTE, ES QUE LOS BILLETES DE METRO SON RIDÍCULOS, APROXIMADAMENTE 0`30 CENTIMOS DE EUROS, NOS ECHAMOS LAS MANOS A LA CABEZA, SOBRE TODO AL DARNOS CUENTA DE QUE DESDE LA ESTACIÓN DE TREN HASTA LA PARADA DE METRO MÁS CERCANA A NUESTRO HOTEL, SOLAMENTE HABÍA UNA PARADA, Y HABÍAMOS PAGADO 30 EUROS A UN TAXISTA….MY GOD!! UNA BUENA TURISTADA!! LLEGAMOS AL HOTEL, NOS DUCHAMOS Y NOS TOMAMOS UNAS CERVECITAS Y PICAMOS ALGO DE NUESTRA COMIDA ESPAÑOLA, SI SEÑORES, VENÍAMOS PREPARADOS CON ALGO DE LA TIERRA PARA ALIMENTAR LA GULA. DESCANSAMOS PARA MAÑANA, QUE TODAVÍA NOS QUEDABA UN DÍA Y YA LO HABÍAMOS VISTO CASI TODO!! YA DESCANSADOS, DESAYUNADOS Y CON LAS PILAS CARGADAS, HOY DECIDIMOS RECORRER LA CIUDAD IGUALMENTE, PERO HACIENDO PARADAS EN LOS SITIOS QUE MÁS NOS HABÍAN GUSTADO, PARA HACERNOS MILES DE FOTOS Y VER ALGUN SITIO QUE NO HABÍAMOS VISTO COMO LOS JARDINES DE VERANO. ESTE JARDÍN ES IDEAL PARA DAR UN PASEO RELAJADOS, CON SU VERDE ESPECTACULAR, SUS ESTATUAS Y FUENTES. VOLVIMOS A LA PLAZA DEL PALACIO Y PALACIO DE INVIERNO, Y A LA IGLESIA DE SALVADOR SOBRE LA SANGRE DERRAMADA O IGLESIA DE LA RESURRECCIÓN DE CRISTO, ES DE LAS MÁS SIGNIFICATIVAS DE SAN PETERSBURGO, SU DECORACIÓN MULTICOLOR LA CONVIERTE EN UN PUNTO DESTACADO EN EL CENTRO DE LA CIUDAD. DESPUÉS DE COMER Y DESCANSAR UN POCO, YA CON LAS MALETAS EN LA RECEPCIÓN, FUIMOS A UNA CAFETERÍA CERCANA, CON PASTELES Y PASTAS CON MUY BUENA PINTA. ASI QUE NOS PEDIMOS UN CAFÉ Y UN TROZO DE TARTA PARA ACOMPAÑAR, MIENTRAS HACÍAMOS TIEMPO Y NOS SERVÍA DE MERIENDA. BUENO PUES YA CON LAS MALETAS EN MANO NOS VAMOS A LA ESTACIÓN. EL TREN APARENTEMENTE PARECÍA MÁS NUEVO QUE EL ANTERIOR, Y UNA VEZ DENTRO COMPROBAMOS QUE SÍ, LA MOQUETA ROJA DEL SUELO HABÍA DESAPARECIDO!! BIEN!! Y ESTA VEZ ÍBAMOS LOS 3 SOLOS EN EL COMPARTIMENTO, POR LO QUE PUDIMOS DESCANSAR MUCHO MEJOR, SIN TENER UN OJO ABIERTO POR SI AL RUSO DE LA LITERA DE ARRIBA LE DABA POR HACERNOS ALGO…JEJE. 08:00 DE LA MAÑANA…Y EL TREN DEJA DE MOVERSE, ESTAMOS DE NUEVO EN LENINGRADSKY, ESTACIÓN DE MOSCÚ. CON GOOGLE MAPS CAPTURADO EN LA PANTALLA DE NUESTRO MÓVIL, INTENTAMOS UBICARNOS NOSOTROS Y A NUESTRO HOTEL…PERO ES COMPLICADO PARA LLEGAR ANDANDO, ASI QUE DECIDIMOS COGER EL METRO QUE NOS DEJARÍA A UNAS CALLES DE NUESTRO HOTEL. POR CIERTO EL HOTEL ERA UN HOLIDAY INN LESNAYA, DORMÍAMOS UNA SOLA NOCHE, Y ERA DE LOS MEJORES HOTELES RELACIÓN CALIDAD-PRECIO QUE HABÍAMOS ENCONTRADO. TRAS REALIZAR EL CHECK IN EN EL HOTEL, Y DEJAR LAS MALETAS EN LA HABITACIÓN, DECIDIMOS DESAYUNAR ANTES DE SALIR A CONOCER LA CIUDAD. ERAN SOBRE LAS 10 DE LA MAÑANA, Y ESTO DE VIAJAR PARECE QUE DA HAMBRE, ASÍ QUE NADA DE CAFÉ Y MAGDALENAS, NOS PEDIMOS UN SANDWICH COMPLETO CON POLLO Y MIL COSAS MÁS, Y UN ZUMO DE NARANJA CADA UNO. SABÍAMOS QUE MOSCÚ ERA MÁS CARO QUE SAN PETERSBURGO, PERO…NO NOS IMAGINÁBAMOS QUE 3 SANDWICHES Y 3 ZUMOS, NOS COSTASEN 85EUROS!!!! MY GOD!! SE NOS QUEDÓ A LOS 3 CARA DE TONTOS….PERO LA VERDAD QUE FUE COMO UN DESAYUNO-ALMUERZO, ERA ENORME, LLEVABA PATATAS…ESTABA BUENÍSIMO…Y NOS SIRVIÓ DE COMBUSTIBLE PARA GRAN PARTE DEL DÍA. ESTA VEZ DECIDIMOS SALIR CAMINANDO, ES MEJOR OPCIÓN PARA IR ENCONTRÁNDOSE POR EL CAMINO DETALLES QUE NO SALEN EN LOS MAPAS NI EN LAS GUÍAS DE TURISMO, SIEMPRE HAY ALGO QUE SI NO PASAS POR DELANTE, NO SABRÍAS QUE EXISTE. NOS ENCONTRAMOS CON UN MERCADO EN LA CALLE, VENDÍAN LAS TÍPICAS MATRIOSKAS, IMANES, FIGURAS, Y TODO TIPO DE RECUERDOS!! ESTÁ CLARO QUE PICAMOS Y NOS COMPRAMOS UNO!! SEGUIMOS, Y NOS ENCONTRAMOS DE FRENTE CON EL TEMPLO DEL CRISTO REDENTOR, UN EDIFICIO ENORME CON GRANDES CÚPULAS COLOR DORADO, ES AL PARECER LA CATEDRAL MÁS GRANDE DE LA IGLESIA ORTODOXA RUSA. CAMINAMOS, Y NOS ENCONTRAMOS SOBRE UN PUENTE, CRUZANDO EL RÍO Y A LO LEJOS SE VISUALIZABA EL KREMLIN. UNO DE SUS LUGARES MÁS EMBLEMÁTICOS ES SIN DUDA LA PLAZA ROJA, QUE EN INVIERNO SE USA PARA MONTAR UNA GRAN PISTA DE HIELO, Y SUS CIUDADANOS DISFRUTAN EN ELLA CON SUS PATINES. EN LA PLAZA SE ENCUENTRA EL FAMOSO KREMLIN, LUGAR DÓNDE VIVE EL PRESIDENTE RUS, LA TUMBA DE LENIN, EL CENTRO COMERCIAL “GUM” Y LA CATEDRAL DE SAN BASILIO, QUE SEGURAMENTE OS RECUERDE A LA IGLESIA DE LA SANGRE DERRAMADA POR SU FORMA Y COLORIDOS, ES MUY BONITA TAMBIÉN. FUE UN DÍA LLUVIOSO, POR LO QUE DESPUÉS DE HACERNOS LAS FOTOS MÁS CARACTERÍSTICAS DEL LUGAR, DECIDIMOS ENTRARA A CONOCER EL CENTRO COMERCIAL G.U.M. , CATALOGADO COMO EL MÁS GRANDE DE RUSIA, CUENTA CON APROXIMADAMENTE 200 TIENDAS, LA MAYOR PARTE SON TIENDAS DE LUJO CON PRECIOS PROHIBITIVOS, PERO MERECE LA PENA CONOCERLO, NO POR SUS TIENDAS SINO POR EL EDIFICIO EN SÍ, ES UN MONUMENTO ARQUITECTÓNICO DE RELEVANCIA NACIONAL. COMO COMPRAR NO PODÍAMOS COMPRAR, DECIDIMOS MERENDAR ALGO EN UNO DE SUS BUFFETS, PIZZA, ENSALADA Y UNA COCACOLA, A UN PRECIO NORMAL. SALIMOS DEL CENTRO COMERCIAL Y EN NUESTRO MAPA, PARECÍA QUE ESTÁBAMOS MUY CERCA DEL HOTEL…PERO NO…ERA UNA CALLE, MUY MUY MUY LARGA, NOS LLEVÓ CASI UNA HORA RECORRERLA!!! SEGUIMOS CONOCIENDO UN POCO MÁS DE LA CIUDAD PERDIÉNDONOS ENTRE NUMEROSOS EDIFICIOS SOVIÉTICOS..
UNA VEZ EN EL HOTEL, NOS BAJAMOS A LA RECEPCIÓN YA QUE ERA EL ÚNICO SITIO DÓNDE TENÍAMOS CONEXIÓN WIFY, Y ALLÍ MISMO, EN AQUEL PRECISO MOMENTO, NOS DIMOS CUENTA DE QUE HABÍA VARIAS SEÑORITAS DE COMPAÑÍA, O MUJERES QUE FUMAN COMO DICE ALGUNA GENTE…JEJE. ERAN MUJERES JÓVENES, GUAPAS, MUY BIEN VESTIDAS Y ELEGANTES, Y A SU LADO LLEVABAN A UN HOMBRE TRAJEADO, BORRACHO Y QUE LES DOBLABA EN EDAD… ENSEGUIDA LOS RESPONSABLES DEL HOTEL LAS INVITARON A ABANDONAR EL LUGAR, SE VE QUE NO LES GUSTABA DAR ESA IMÁGEN DE MOTEL DE CARRETERA…JEJE. DESPUÉS DE SUBIR 100 FOTOS, TOCABA DESCANSAR PARA MAÑANA, TODAVÍA TENÍAMOS PROVISIONES EN LA MALETA, ASÍ QUE CENAMOS ALGO LIGERITO EN LA HABITACIÓN. SUENA EL DESPERTADOR, Y VAMOS EN FILA INDIA Y POR ORDEN A LA DUCHA, ERA EL ÚLTIMO DÍA Y TENÍAMOS QUE APROVECHAR. ESTA VEZ NO CAÍMOS EN LA TRAMPA DEL TURISTA, Y NO DESAYUNAMOS EN EL HOTEL…NOVATADAS UNA Y SUFICIENTE!! ASÍ QUE DECIDIMOS LLEGAR HASTA EL CENTRO DE MOSCÚ, POR UNA CALLE PEATONAL, DONDE ESTÁ EL HARD ROCK, NOS ENCONTRAMOS TAMBIÉN UN MCDONALDS, Y COMO NO, NO PODÍA IRME DE ALLÍ SIN PROBARLO!! ASÍ QUE VENGA, UN BUEN DESAYUNO Y A PROBAR LA HAMBURGUESA “MC SOVIETIC” O ESO CREO RECORDAR, JEJE. HABÍAMOS QUEDADO CON UNA AMIGA DE PABLO QUE ESTUDIABA ALLÍ, SOBRE LAS 13:00H, UNA CHICA MUY MAJA POR CIERTO. HABÍAMOS QUEDADO EN UN PARQUE, QUE TENÉIS QUE VISITARLO SÍ O SÍ, A MI ME ENCANTÓ, SE LLAMA “GORKI PARK”, TREMENDO. SE ENCUENTRA EN EL CENTRO DE MOSCÚ, PERO LO QUE HAY DETRÁS DE SU GITANTESCA ENTRADA DE PIEDRA, HACE QUE TE SUMERJAS EN PLENA NATURALEZA. ES UN ESPACIO ABIERTO, DE APROXIMADAMENTE 120 HECTÁREAS, PENSADO PARA EL DESCANSO, EL TRABAJO O EL ESTUDIO. PODRÉIS VER DESDE SU CÉSPED LLENO DE PUFFS ENORMES DÓNDE PODRÉIS SENTAROS A LEER, A DESCANSASR, A DORMIR UNA SIESTA…PRACTICAR CUALQUIER DEPORTE COMO VOLEY, BALONCESTO, FÚTBOL, PATINAJE, ANDAR EN BICICLETA, DISFRUTAR DE SU SKATEPARK DE 900 METROS CUADRADOS, TENÉIS LA POSIBILIDAD DE ALQUILAR BICIS, PATINES…INCLUSO IMPARTEN CLASES VARIOS DÍAS A LA SEMANA. DE PRONTO EN UN LADO DEL PARQUE, OBSERVAMOS UN RECTÁNGULO GRANDECITO DE ARENA DE PLAYA, SI SI SI, Y AHÍ ESTABAN TOMANDO EL SOL, YA QUE ESTABA SITUADO EN LA ORILLA DEL RÍO. PONEN PISTAS DE PATINAJE DE HIELO EN INVIERNO, HAY RECORRIDOS SOBRE CUERDAS, COMO TIROLINAS; VARIOS JARDINES, FUENTES….INCREIBLE. ESTUVIMOS PASEANDO Y LUEGO NOS TIRAMOS EN LOS PUFFS PARA HABLAR Y DESCANSAR, Y PARECÍA QUE EL RELOJ SE HABÍA PARADO, Y NOS HABÍAMOS TELETRANSPORTADO A OTRO LUGAR…ERA UNA MARAVILLA, ME ENAMORÉ DE ESE PARQUE. Y UNA COSA QUE ME LLAMÓ MUCHÍSIMO LA ATENCIÓN, A PESAR DE QUE EL PARQUE ESTABA LLENO, HABÍA GENTE POR TODAS PARTES, ESTABA COMPLETAMENTE LIMPIO, NI UN SOLO PAPEL EN EL SUELO, LA VERDAD QUE ME PARECIÓ ADMIRABLE. BUENO YA EMPEZÁBAMOS A TENER HAMBRE, ASÍ QUE DECIDIMOS PROBAR LA COMIDA RUSA, YA ERA EL ÚLTIMO DÍA, Y NO PODÍAMOS MARCHARNOS DE ALLÍ SIN COMER EN ALGÚN SITIO TÍPICO, Y PARA ESO ELEGIMOS UNA CADENA DE RESTAURANTES, LLAMADA “MU.MU”, SU ICONO ES UNA VACA…JEJEJEJE. BUENO NO ERA NADA DE OTRO MUNDO, ERA TIPO BUFFET Y HABÍA DESDE SOPAS TÍPICAS, CARNES, POLLO….FUE BASTANTE ECONÓMICO, PAGAMOS SOBRE 8EUROS POR PERSONA. HABÍAMOS COMIDO BASTANTE TARDE, CASI PARECÍA UN ALMUERZO-MERIENDA, YA SABÉIS QUE CUANDO SE VIAJA, LOS HORARIOS SON UN POCO VARIABLES…AL MENOS ESO ME PASA A MI, LOS HORARIOS DE SUEÑO Y COMIDA LOS TENGO BASTANTE DESCONTROLADOS. CUANDO ESCUCHAMOS LA PALABRA “RUSIA”, SE NOS VIENEN A LA CABEZA VARIAS COSAS, PLAZA ROJA, FRÍO, GORROS DE PIEL…Y COMO NO, VODKA!!! PUES PARA DESPEDIR NUESTRA PEQUEÑA ESCAPADITA, QUÉ MEJOR MANERA QUE CON UN BUEN VODKA. ENTRAMOS EN UNA ESPECIE DE “PUB”, ERA RESTAURANTE EN LA PARTE DE ARRIBA, Y AL BAJAR LAS ESCALERAS, CON SUS PAREDES DE COLOR ROJO, Y LUCES POR TODOS LADOS, LLEGAMOS A LA ZONA DE DISCO, SI…ERA COMO UNA DISCO, PERO A LAS 7 DE LA TARDE. A MI REALMENTE ME DIO LA SENSACIÓN DE UN BAR DE CARRETERA…DE ESOS QUE TIENEN MUCHAS LUCECITAS…PERO AL PARECER, ALLÍ SON ASÍ!! 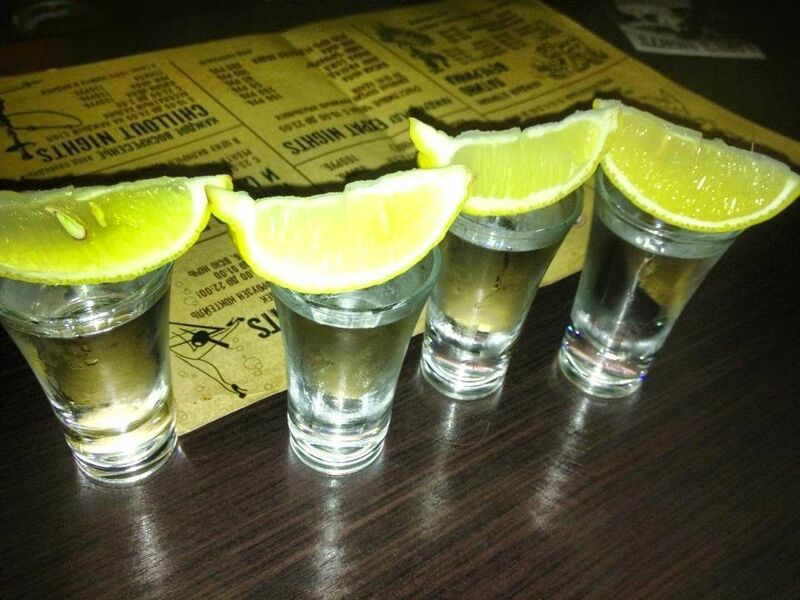 PUES ALLÁ VAMOS, A PEDIRNOS UN VODKA CADA UNO, CON SU LIMONCITO POR SUPUESTO. ENTRE HISTORIA E HISTORIA, Y CARCAJADA Y CARCAJADA, OTRO VODKA Y LIMÓN, Y OTRO….BUENO, DECIDIMOS SALIR DE AQUEL LOCAL A LA HORA JUSTA, PARA PODER RECORDAR EL DICHO ESE DE QUE “UNA RETIRADA A TIEMPO…ES UNA VICTORIA” JEJEJE. SALIMOS LOS 4 DE AQUEL SITIO, ENTRE RISAS Y DESPEDIDAS, YA QUE LA AMIGA DE PABLO SE BAJABA EN UNA PARADA DE METRO Y A NOSOTROS TODAVÍA NOS QUEDABAN UNAS CUANTAS. NOS HABÍAN DEJADO GUARDAR LAS MALETAS EN LA RECEPCIÓN, ASÍ QUE LLEGAMOS AL HOTEL, DESCANSAMOS UNOS MINUTOS, Y RECOGIMOS TODAS NUESTRAS COSAS PARA DIRIGIRNOS A LA ESTACIÓN DE TREN QUE ESTABAN UNA CALLE MÁS ARRIBA DEL HOTEL. DESDE ALLÍ SALÍA A MEDIA NOCHE UN TREN HASTA EL AEROPUERTO, QUE NOS COSTÓ APROXIMADAMENTE 15EUROS POR PERSONA. PASAMOS EL TIEMPO COMO PUDIMOS, LA VERDAD QUE NO NOS ABURRIMOS MUCHO, HAY MOMENTOS EN LOS QUE TODO TE RESULTA GRACIOSO, PUES ESOS MOMENTOS, ESOS MISMOS DURARON TODA UNA NOCHE EN EL AEROPUERTO DE MOSCÚ. DE VUELTA, HICIMOS ESCALA EN PRAGA, Y LA VERDAD, QUE NO FUE NADA AGRADABLE…SOLO RECORDARLO Y YA ESTOY SUDANDO; EL AVIÓN LLEGÓ CON 1 DE RETRASO, Y LA PUERTA DE EMBARQUE DE NUESTRO AVIÓN DE ENLACE, ESTABA EN LA OTRA PUNTA, YO NO SÉ, CREO QUE NUNCA CORRÍ ASÍ…HABRÍAMOS BATIDO EL RÉCORD DE METROS LISOS POR AEROPUERTO SEGURO!!! CORRÍAMOS Y CORRÍAMOS, HASTA QUE LLEGAMOS A UNA SEÑORITA QUE NOS DIJO QUE NUESTRO VUELO NO HABÍA SALIDO, YA QUE NOS ESTABAN ESPERANDO…PERO QUE ENTRÁSEMOS AL AVIÓN CON DISIMULO, SIN QUE LOS DEMÁS VIAJEROS NOTASEN QUE ESTÁBAMOS CANSADOS…YO ME PREGUNTÉ ESO QUÉ MÁS DARÍA…HASTA QUE UN HOMBRE MUY AMABLEMENTE, NOS DIJO QUE LLEVABAN UNA HORA ESPERÁNDONOS PERO LOS PASAJEROS CREÍAN QUE HABÍA UN PROBLEMA TÉCNICO EN EL AVIÓN…MY GOD!!! PODRÍAN MATARNOS! !JEJE ASÍ QUE DISIMULANDO…ENTRAMOS, DESPEGAMOS, DORMIMOS Y ATERRIZAMOS!! BUENO, PARA DAR FIN A ESTE POST, VOY A CONTESTAR A LA PREGUNTA DEL MILLÓN. SON COMPLETAMENTE DIFERENTES, SAN PETERSBURGO DA SENSACIÓN DE TRANQUILIDAD, CIUDAD PEQUEÑA Y MÁS EUROPEA, PERO CON GRAN CANTIDAD DE ENCANTOS…Y MOSCÚ, ES MÁS CIUDAD, MÁS CAOS, ES ENORME Y SUS EDIFICACIONES NO TIENEN NADA QUE VER. POR SU PUESTO QUE TIENE LUGARES MÁS IMPORTANTES QUE CONOCER, POR LO QUE RECOMIENDO QUE SI ALGÚN DÍA VIAJÁIS A RUSIA, AMBAS SERÍAN UNA PARADA OBLIGATORIA. TANTO A MI COMO A MI NOVIO, NOS GUSTÓ MÁS SAN PETERSBURGO, PERO SI VOLVIERA A REPETIR EL VIAJE SABIENDO LO QUE SÉ, VOLVERÍA A VISITAR LAS 2.